Time tracking information can be defined at the task level or at the subtask level. These values represent hours of work and have to be set manually. 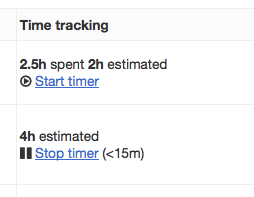 Subtasks also have the fields “time spent” and “time estimated”. When you change the value of these fields, the task time tracking values are updated automatically and becomes the sum of all subtask values. Kanboard records the time between each subtask status change in a separate table.